Bronchospasm is the contraction of smooth muscle in the walls of the tubes in the lungs known as bronchi and bronchioles, causing narrowing of their lumen and the obstruction of respiration. 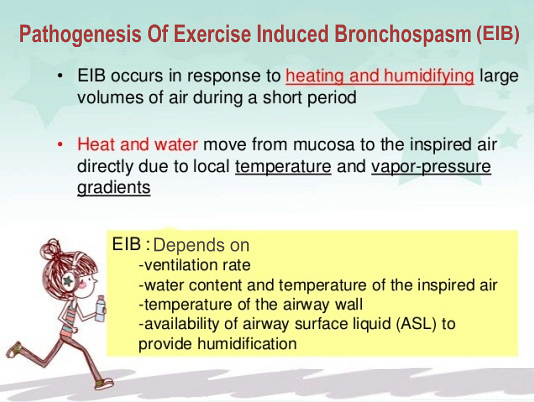 There are many potential causes but here we are discussing exercise-induced bronchospasm. 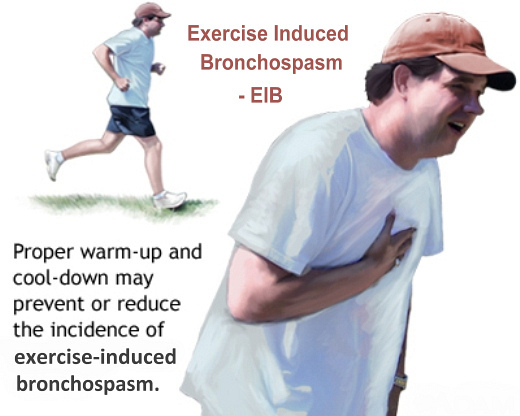 What Is Exercise Induced Bronchospasm? Exercise induced bronchospasm (also called EIB) happens when the airways in your lungs shrink (get smaller) while you are exercising. This makes it difficult to breathe. If you have EIB, it can be hard for you to exercise for more than 30 minutes at a time. What Are The Symptoms Of Exercise Induced Bronchospasm? 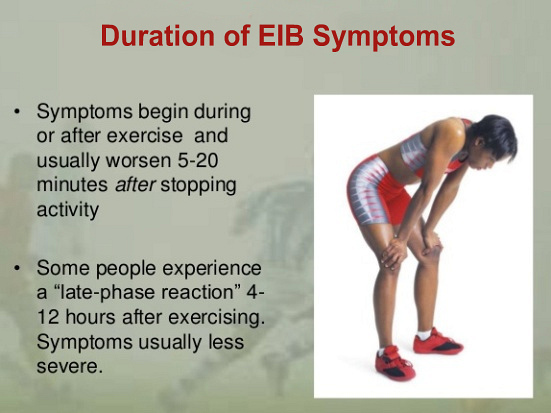 Symptoms of EIB typically start after 5 to 20 minutes of nonstop exercise, and may include wheezing (breathing that makes a hoarse, squeaky, whistling or musical sound), difficulty breathing, chest pain, coughing, and chest tightness. Breathing in air that is cooler and drier than the air in your lungs during exercise may cause EIB. If you have exercise induced bronchospasm, your symptoms may get worse during spring and fall, when people tend to have trouble with allergies. How Can My Doctor Tell That I Have Exercise Induced Bronchospasm? Your doctor will ask you questions about your symptoms, do a physical exam and perform breathing tests. During a breathing test, your doctor will have you breathe into a spirometer or a peak flow meter. These devices measure how much air you are able to blow out of your lungs. If your doctor thinks you might have EIB, he or she will help you decide on the right treatment for your symptoms. How Is Exercise-Induced Bronchospasm Treated? • A short-acting bronchodilator: This medicine is usually taken 15 minutes before exercise and lasts 4 to 6 hours. • A mast cell stabilizer: This medicine is usually taken 15 minutes to 1 hour before exercise and lasts for 4 hours. • A longer acting bronchodilator. This medicine is usually taken 30 minutes before exercise and lasts up to 12 hours. • An anti-leukotriene: This medicine lasts up to 24 hours. It is taken every day and helps keep your airways from shrinking. You and your doctor will talk about which medicine is right for you. He or she will tell you how to take your medicine. It is important to follow your doctor's instructions carefully to make sure your medicine is effective. A warm-up and cool-down period of at least 15 minutes before and after exercise may help lessen the symptoms of EIB. Avoid exercising in extremely cold temperatures or when you have a respiratory infection, such as a cold or the flu. If you have allergies, avoid exercising when pollen levels are high. Also, if you smoke, stop.